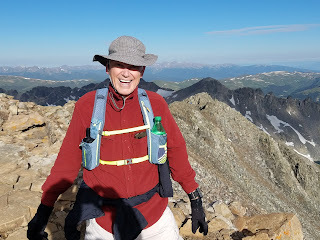 Each summer I enjoy hiking to the top of a 14,000+ foot mountain peak in Colorado or California with some hiking buddies who partake in the same sport. We start at 4 am so we can get to the top and back down to the tree line before the afternoon lightening storms. This year we had the pleasure of hiking Mt. Quandary. Mt. Quandry trail to the top. View from the top of Mt. Quandry. Mt. Quandry summit 14,265 feet. Happy to be at the summit - August 12, 2017.